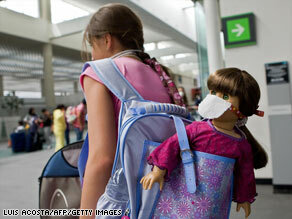 Medicine and Technology: A Swine Flu Guide for Parents? A Swine Flu Guide for Parents? No. 1 on the list: washing hands more frequently. I think we all knew that already. However, it's always good to be reminded. Make sure you wash your hands and use antibacterial gel to cleanse your hands wherever you go. Maybe now, people will actually wash their hands after they use the bathroom. Image source: CNN. Oh Please. Why don't we all just buy stock in hand sanitizer? Anyone would have to use it every 15 minutes every single day for it to actually be effective.